These five bits of news are presented in roughly the order they matter; Uber and Google matter most of all. Driver and rider markets do interact, and it’s that interaction that creates a winner-take-all dynamic…In the case of Uber and Lyft, ride-sharing is (theoretically) habitual, both companies will ensure the prices are similar, and the primary means of differentiation is car liquidity, which works in the favor of the larger service. Over time it is reasonable to assume that the majority player will become dominant. That is indeed how the ride-sharing market has played out: as of earlier this year Uber provided over 80% of rides in the United States (the only market Lyft competes in), despite Lyft’s determination to spend hundreds of millions in subsidies and free rides. And, on the flipside, Uber left China earlier this month, tired of spending their own billions in a futile attempt to displace the dominant Didi. Self-driving cars change these market dynamics in two important ways: first, drivers are no longer a scarce resource, which means there are no longer two-sided market forces at play. Second, the single best way to change consumer habits and preferences is through lower prices, and eliminating drivers is the most obvious way to do just that. Small wonder then that Uber is investing so heavily in self-driving cars, including hiring a huge number of Carnegie Mellon researchers (thus the Pittsburgh location of the self-driving trial), as well as paying ~$680 million for Otto. I think we’re catching up. Look at some of the folks and how long they’ve been working on it. Lots of respect for an area that they’ve pioneered, and we’ve got to do some catch-up. And that’s OK, but it means we gotta wake up early and we’re going to bed late. 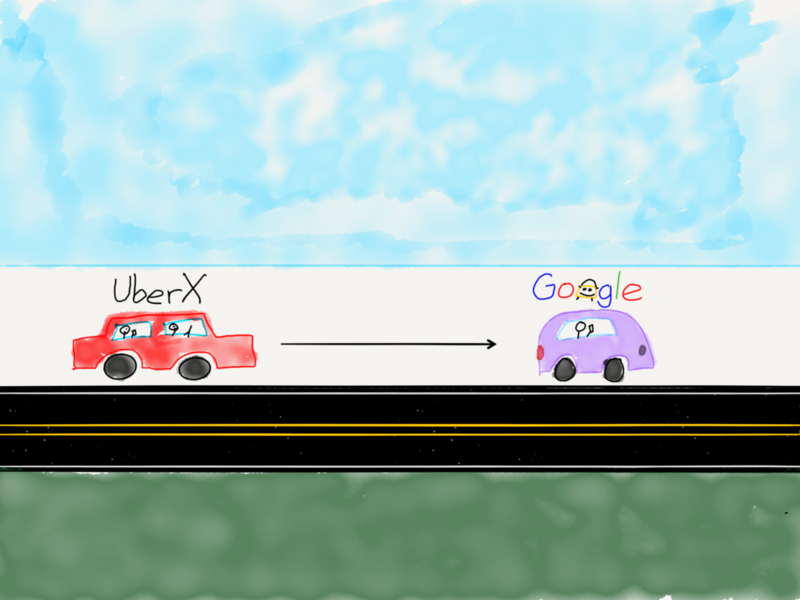 I’ll take Kalanick at his word; Uber, though, still has some very important advantages that make this race a bit more complicated than it seems, and the journey I depicted above a lot less linear than it may appear. 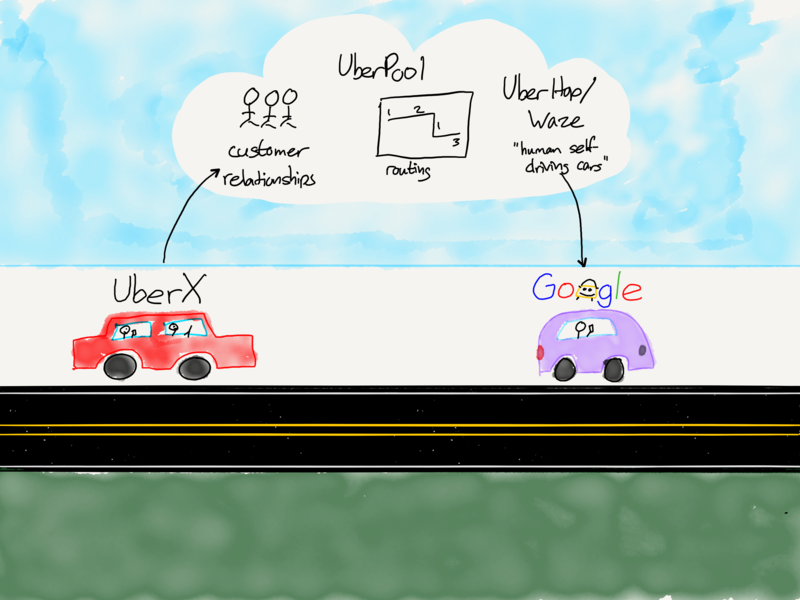 The shift from an UberX model to self-driving cars will require changes in every component. It’s clear why drivers and riders are the most important pieces here: drivers bring their own cars, existing mapping solutions are good enough, and routing is relatively simple. To be sure, that relatively modifier is important: managing millions of matches a day between drivers and riders is a hugely complicated undertaking, and the fact that Uber has been working on the underlying algorithms for years is a big advantage. It’s also an advantage that will become ever more critical. It’s the routing piece that is the most important; Uber investor Bill Gurley has called the development of the necessary algorithms to make UberPool a success a BHAG: Big Hairy Audacious Goal, and it’s an investment that will be critical for Uber going forward. First, as Gurley’s title suggests, getting the algorithms behind UberPool right is an incredibly complex problem. It’s basically the traveling salesman problem on steroids, and the only real way to solve it is to slowly but surely work out heuristics that work in real world situations.1 Combine that reality with the fact that Uber has a dominant share of drivers and riders, giving the company sufficient liquidity to offer UberPool in multiple markets, and the result is that Uber is undoubtedly far ahead of competitors — present and potential — in solving these problems. One of the more interesting facts about the new Waze service is that it is true ride-sharing: Google is capping the price at 54 cents a mile, which means it’s impossible to make money by simply driving-for-hire. More prosaically, that happens to be the IRS standard mileage rate, which means Google can plausibly claim their service is facilitating, well, ride-sharing and the sharing of gas money without all of the complications of hiring contractors. Uber launched UberCommute just a few weeks after that article; given that the economics of UberCommute are approaching those of self-driving cars, that means the company is ahead when it comes to figuring out the business model as well. Note that there are two critical leaps that need to be made: cars and maps. Google is clearly well ahead in maps, but Uber is investing $500 million to catch up, even as it does the same for self-driving technology. Indeed, Uber has their own advantages in routing, business model, and customer attachment, and those are just as formidable and potentially more defensible than Google’s tech leadership. Ford certainly knows how to build cars, but self-driving technology is a software problem; there is no evidence to suggest that Ford has the capability to leap ahead of Google or Uber. Moreover, while Ford’s relatively slim margins may make a ride-sharing service attractive, nearly every aspect of the company would need to transform itself from a product model to a service model, and that is even less likely than the company leading the way in self-driving technology. I think it is much more likely Ford will eventually partner with Google or Uber as an OEM. Nutonomy is very interesting, not only because of their technology, but also because of the smart way they are dealing with perhaps the most important piece of transportation-as-a-service: the government. I have argued for years that Singapore was likely to be the first place where self-driving cars take off: the technology already works as long as you get rid of those pesky human drivers, while Singapore has placed strict limits on automobiles for years, and, to put it delicately, Singapore has the government structure to get rid of non-self-driving cars completely. By starting there Nutonomy has a big advantage when it comes to real-world experience and iteration, and could springboard from Singapore to other urban areas. That leaves Google and Uber, and, despite yesterday’s news, I still like Uber’s chances. First, it matters that the development of self-driving cars is, in Kalanick’s words, “existential” for the company. Never underestimate the motivating power of simple survival, and, on the flipside, keep in mind how poorly Google has done in any business that is not advertising-based. Second, I suspect Uber’s routing advantage (as infuriating as it may be when you are matched with a driver who is going the wrong way) is a real one: telling cars where to go at scale is an incredibly difficult problem and Uber has a multi-year head start. Third, any discussion of the threat self-driving cars poses to Uber tends to imagine a world where there are magically tens of thousands if not millions of self-driving cars everywhere immediately. That simply isn’t practical from a pure logistics standpoint; the time it will take to build all of those cars — and, crucially, get government approval — is time Uber has to catch up. Moreover, it’s not at all clear that Google will be willing to make the sort of investment necessary to build a self-driving fleet that could take on Uber. The company’s recent scale-back of Google Fiber is instructive in this regard: it is very difficult for a company built on search advertising margins to stomach the capital costs entailed in building out a fleet capable of challenging Uber in more than one or two markets. Finally, as the incumbent in the transportation-as-a-service space Uber has the advantage of only needing to be good-enough. To the degree the company can build out UberPool and UberCommute, they can ensure that their own self-driving cars get first consideration from consumers trained to open their app whenever they are out and about. Needless to say, the next few years will be fascinating to watch. The only sure thing is that the Uber-Google battle in particular will be quite the ride.